Remember?! I believe that it will undoubtedly require a three-pronged attack to help you conquer depression! Now … it is true … you can try one thing … or two things … if that’s all you choose to do or want to do. However, I can guarantee you that all three of these things will help you land the winning blow! Your doctor … a trusted counselor … and the power of your faith! As I have said repeatedly, I am not a medical doctor nor am I a trained counselor – but I do consider myself a trained professional in the arena of faith! So when it comes to asking questions about how your faith can dismantle depression … well … then … I am your girl! Last week, the faith advice that I gave to you was to read your Bible every day! Did you do it? I certainly hope so because your faith will give you the relief that other solutions will never be able to offer. 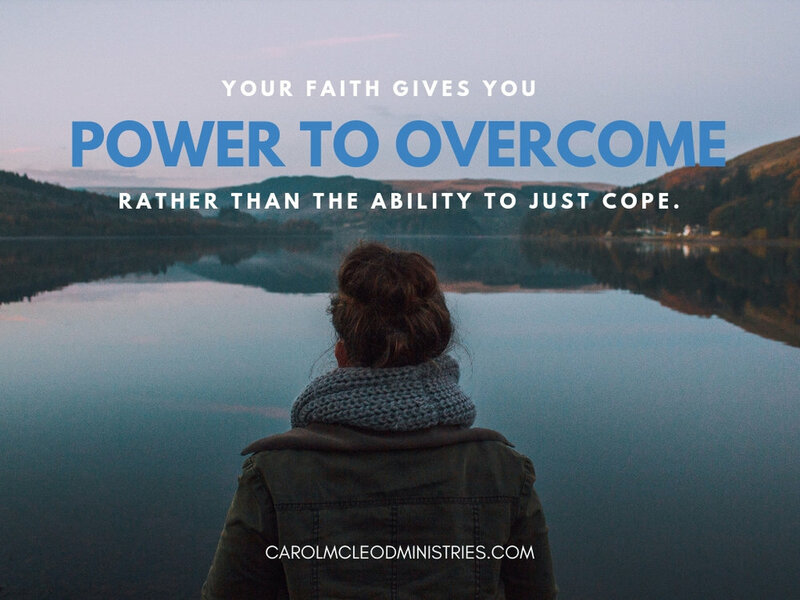 Your faith gives you power to overcome rather than the ability to just cope. Read your Bible every day … or even two or three times a day if you are in the pit of despair. I know that I know that I know that Jesus will meet you there as you open the Word and as you drink in His wisdom and splash in His promises. So … in addition to reading the Word of God that was divinely meant to bring healing to your life … is there anything else that you can do? Are there any other spiritual disciplines that might just bring the healing power of God to rule and reign in your life? I am so glad that you have asked … because I can’t wait to coach you! Now that you are reading your Bible every day, the next part of your healing prescription is to worship. Lift your hands in worship! Lift your heart in worship! Open your mouth in praise! Let a song rise up from within! Dance in His presence … jump up and down for joy! Worship has the innate and divine ability to counteract all of the effects that depression has had upon your life. Oftentimes when depression comes a-knocking at my door, I just turn on a Pandora worship station and I let it play while I am doing the dishes or when I am folding clothes. Or I choose a YouTube Channel that is filled with the songs of my favorite worship leaders and I just let it play all … day … long. I let it play all … night … long. David was a man in the Bible who often dealt with discouragement, melancholy and even depression. He was also a man who cried out to God in the midst of his emotional pain. He didn’t allow the malaise of his soul to separate him from the Father but he used it to propel him into God’s presence! Did you know that David had a son who died? Certainly sending a baby boy to heaven is reason enough for a man to throw himself into the depths of depression. I cannot imagine a pain more horrific or paralyzing than the pain of losing a child. If anyone deserved to crawl into the black, bottomless pit of depression and never come out again, it was David. But, what you deserve to do and what you should do are two different roads entirely. It is breathtaking to me that at the very worst moment of David’s life that he chose to change his clothes and to worship! David removed his garment of mourning and he put on a garment of praise. depression of the very worst kind, like David did, you need to change your clothes. Choosing to dress yourself in a garment of praise may be the most difficult choice that you have ever made in your lifetime – but it will also be the most powerful choice you have ever made. It will be the healthiest choice you have ever made. It will be the most life-changing choice you have ever made. After you have read your Bible, then you joyfully and willingly put on your garment of praise! Get ready to dance in spite of your feelings! And then what did this ordinary man do who was experiencing gut-wrenching grief? If you long to flourish and to move beyond the disappointment and the depression then this is what you will do: You will worship! David chose to move past his emotional pain and into his destiny. While you are gasping for air, you will lift your hands heavenward and emphatically declare the goodness and faithfulness of God. We have been given very powerful weapons to use while reaching for an abundant life and worship is one of these weapons. Worship is one of the most powerful cleansing agents to deal with the pain of your past. Worship will heal your mind and your memories; it will take the power out of your pain and restore you to emotional health. Worship does not stuff our pain but it brings hope to our weary and storm-tossed souls. So, my friend … if you are dealing with depression today … please see your medical doctor … find a trusted counselor … read your Bible … and worship!